Welcome to Garden Bloggers' Bloom Day for February 2014. Here in my USDA Hardiness Zone 6a garden in central Indiana, we are snow-covered and there are no blooms to show outdoors. In fact, we were just blessed with another five inches of snow yesterday, which moved this winter up to the fourth snowiest winter in Indianapolis since they started keeping records. Officially, they've measured 50.2 inches so far this winter. I'm not too excited over fourth place because I was here for the first, second and third snowiest winters, too. The record, by the way, is 58.2 inches, set in 1981-82. Ah, yes, those were the days. This bloom day is in stark contrast to bloom day a year ago, when I had a little puddle of snowdrops to share along with the first crocus blooms and the sweet scent of witch hazel. This year's bloom day is more like the inaugural bloom day back in February 2007. The garden was snow-covered back then, too, and I just knew others had blooms in their gardens, so I started Garden Bloggers' Bloom Day to find out for sure. This will certainly be a winter we'll talk about for some time because the near record snowfall has also been accompanied by near record cold temperatures. Brrrr... too many mornings with sub zero temperatures for my liking. 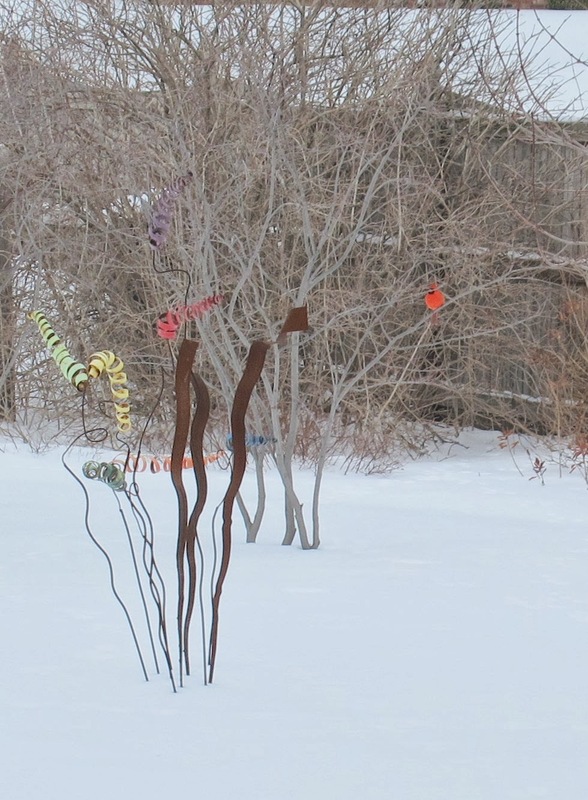 Meanwhile, out in my garden, I did catch a hint of color when a male cardinal stopped by to admire the sculpture nearby. The cardinal nearly glows against the white snow. Just for fun I checked for that little puddle of snowdrops planted near the base of the post light out front. 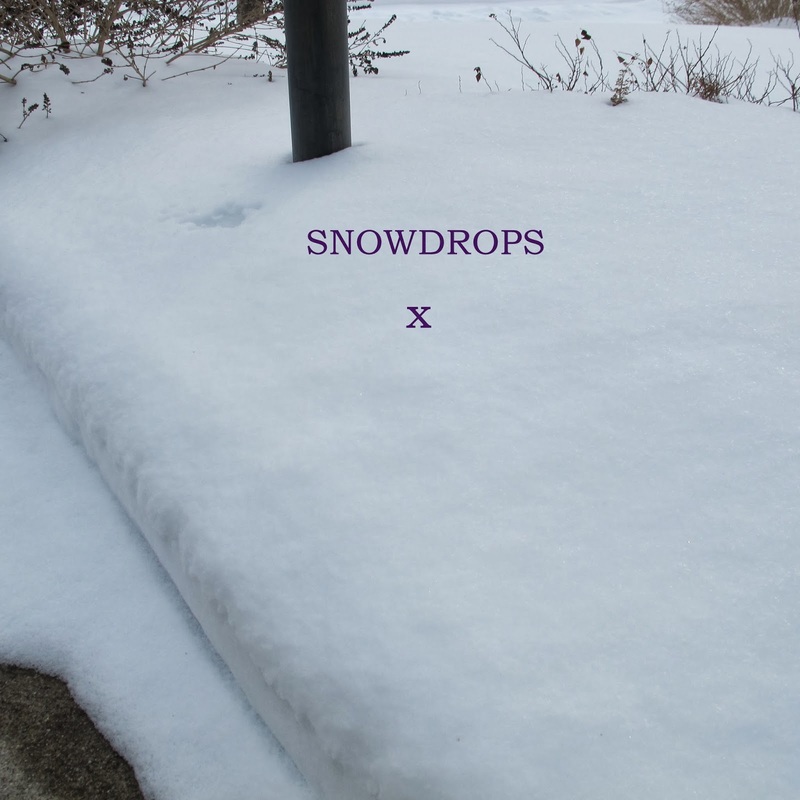 "X" marks the spot where I will surely find those snowdrops when the snow finally melts. What's blooming in your garden on this wintry February day? Please tell me! Please show me! All this white is making me forget colorful flowers! It's easy to join in for Garden Bloggers' Bloom Day. Just post on your blog about what is blooming in your garden on the 15th of the month and leave a comment to tell us what you have waiting for us to see so we can pay you a virtual visit. Then put your name and the url to your post on the Mr. Linky widget below to make it easy to find you. Still snowy here though not quite as much as you've had. I am hoping for snowdrops next month as they are in a sunny spot by the house. Hi Carol: Thanks for hosting as always. Yes, the snow and cold just keep coming this winter. Warm-up ahead next week will feel great. I messed up with my link (sorry). I meant to type in Beth@PlantPostings, but I can't seem to undo it. Oh well. Thanks again for hosting! Hi Carol - wow, you guys have really been smacked with snowstorms this winter. No snow here, but colder than normal so fewer flowers for the February GBBD. My post is on Annie's Addendum. We have cardinals here too, but they look more wonderful when seen against snow. I hope you see your snowdrops soon! The cardinal is so beautiful, and at least you have not lost your sense of humour! Here we battle against gale force winds and record rainfall. Squelch. Brrr, it certainly looks cold. Here's hoping your snowdrops are able to make their appearance soon, and you can thaw out. Love the glimpse of the cardinal. Such a bitter winter must be so tough for the wildlife. If I lived an hour further north than here in Scotland then I'd also be under so many feet of snow. Thankfully we've only got snow flurries and I can still see the flowers. I've got crocus, witch hazel,snowdrops and cyclamen in flower at the moment. I know how you feel Carol as we have 3 feet of snow on the ground and no birds or blooms....so I had to do a bit of dreaming to get me some Bloom Day!! Thanks for hosting and wishing you and me a melt soon. Your snowdrops will be nice and snug under all your snow. The Cardinal showed up beautifully against his white background. We in the Uk are having storm after storm, the garden is so waterlogged, we can't walk on it, we all just hope the rain will stop soon. I feel for all the people whose homes and businesses are flooded and have been for weeks now. While we haven't had the amounts of snow you have had our garden has been snow covered as long. It feels very strange not being able to find snowdrops at this time of year. Happy GBBD anyway. We will just have to think warm snow-free thoughts. Carol, we too are having a winter to remember in the UK, but for completely different reasons to you. Constant rain and gales for two months is dramatically altering the view of our country, both on the coast and inland. It's also thwarted my planned post for this week, but there is still something to show you which I hope will be thought provoking. Been sick. Garden isn't as pretty as it should be cause it's cold. Thanks May for hosting once again.....you are an inspiration.. Sorry, but no outside shots this time. All takes place in my greenhouse. I know. Fudging a bit, but bloom is where you find it in winter. We don't have anything blooming, but I did come across some special heart shaped foliage from last years garden for Valentine's Day! Hi Carol, it looks like the forecasts of weathermen are correct as the impact of climate change, that temperate countries will have colder winters and hot tropics will have hotter or longer dry seasons. We don't experience lack of colors but sometimes our annuals really totally dry. But we normally have still a lot of colors even during the long dry seasons. And i am parading some of them here, to alleviate your coldness and give you a semblance of garden life. Come to us, we are inviting you, or at least look at our blooms. Thanks again for hosting. Thank you for bundling up and continuing the meme. There are blossoms at my place. Spring is starting the slow trek northward. I am glad to be back for this bloom day. Thank you for hosting. Although I don't have much to share there are a few things popping up. I think we would have been glad for your snow cover this year if only for the water it would put into the ground. However, it has been very, very cold and dry. Many plants have been lost. But gardeners are tough and don't give up, do they? My garden looks much the same, Carol, complete with cardinals. We got another dumping of snow yesterday, too, and I can't keep track of where we stand in the record books now. But I'll gladly take the snow over the ice! At least the snow is keeping your snowdrops protected from the cold. Thanks for hosting this every month, Carol, and keeping us optimistic that there will be blooms one of these days! Carol, Just yesterday looking through my own blog thinking how much I wished it was Spring, and how much I missed my roses. I was feeling sad because I'd just pruned them and they look so bare. I guess after seeing your winter I should not be complaining in Southern California. I still have flowers and green where as you are covered in white. But at least you have the Spring to look forward to. I'm a bit worried about us here due to the lack of rainfall. We are in a drought so who knows what this Summer will be like. I guess I'll have to wait and find out but for now I will be grateful for what I have. How nice of you to continue the celebration of winter for those of us who don't have any snow to enjoy and have to look out at grey skies and rain! Thank you! Next time, they should have the winter Olympics where you live. They'd save a bundle in the artificial snow budget! Spring is only 33 days, 1 hour, and 16 minutes away! (But who's counting?) Happy GBBD Carol and thanks for once again hosting the party! Happy GBBD Carol and thanks as always for hosting. We will certainly remember this winter on both sides of the Atlantic for the wrong reasons :( Hope that it's not too long before your snowdrops and other early spring bulbs and flowers start to shine. I'm glad that the cardinals were available to add some color to your garden. I hope you get a melt soon. The situation in southern California couldn't be more different - we have plenty of blooms; however, the rain to water them is in very short supply. Thanks, as always, for hosting GBBD! X marks the spot. The last time we had a thaw, I saw some snowdrop shoots peeking out of the ground, so I know they are there. It must be especially hard to see snow on the ground when you've had blooms in other years. Me, I never expect blooms in February. Not outside, at least. I like your hints of colors anyway, Carol! Sorry you're so socked in. We were on Wednesday, at least to the extent that we're ever socked in. But my garden is still way behind on its normal bloom count. Carol, I'd like to give you a landscape design tip. You have too much white in your garden. I'd take some snow to get a glimpse of that gorgeous cardinal. I miss seeing them out west here. Sorry you have no flowers outdoors, but very glad to help you enjoy ours! Last week at this time my garden was also covered with snow (very unusual for us here in Portland, OR, in February). Thankfully this week it's just a memory. Sorry you won't be joining us this July for the GB Fling! This looks like a fab idea. I'm hoping to join in from next month. Hi carol, thanks for hosting, it is a wonderful opportunity to do some first class Blog- Hopping! You are having the most terrible winter, you must be longing for Spring to come ! I have been round the garden with a magnifying glass trying to find enough blooms to photograph for my post!! All about indoor plants for many of us in the USA who are socked in by the snow and ice -- Spring, where are you? We've yet to have a snowfall of any significance here in Edinburgh. Those stateside have had it bad this year. I do hope you get a break in the weather pretty soon. As usual thanks for hosting Carol. Thanks for hosting Bloom Day. I love it. I just started my own blog and joined in for this month's GBBD! Oh snow. The first flurries are always so exciting, then as time goes by we want to see our gardens again. I hope it clears soon and that you get to see those lovely snowdrops. I have just published my first post at www.legrysfarm.com and joined GBBD for the first time too. Thank you for hosting this. I'm off to see what other bloggers have in bloom now. Oh my gosh, you have reminded me I finally planted Snowdrops! I can't wait to see them but here, too, lots of snow! Thanks again Carol for hosting this Bloom Day! I almost forgot to post, do you have any tips on how we could remind ourselves? I suppose, I could just schedule it in my planner, right? Thanks again! Now, to go back and read all of the other posts and comment on them! Your graciousness in hosting GBBD made me look for the sunny side of life. And that's no easy feat when you get excited about melting icicles. Another month, another bloomday ...heres to impending spring ! In Chattanooga TN we are thawing out from a 10"+ snowfall. I can't imagine what 50" feels like, I hope you are staying warm!! Hello, I thought I'd post these flowers pictures to show you some thing different! Thank you for the opportunity. I hope everyone dealing with the snow stays warm, and everyone dealing with the drought gets water soon! Thank you for hosting GBBD once again, Carol! A return to "normal" would be nice! We don't have record snow (or any snow! ), but we are enduring the worst drought on record. It's been a while since we have had a normal year. But thank you, Carol, for continuing to host GBBD. I always look forward to seeing the different gardens through the seasons! What a perfect blanket of snow is covering your snow drops. I bet next month is gangbusters in your garden. Hi Carol! I love your cardinals, and your snowdrop dreams. No snow In Austin, but 1/500th of an inch of ice shut down the city for a day! Thanks for hosting GBBD. Back after a long time. Thanks for hostessing. GBBD. Hi Carol, Happy GBBD! Hoping Spring comes your way soon. White is pretty but I prefer the Algarve. I hope you get to enjoy spring really soon! I thought I didn't have flowers yet because the front garden hellebores are not blooming yet, but the rear ones are. No snow here, though the wind and rain have had the same effect in keeping us indoors - so the garden's looking bedraggled and miserable. More weather on the way, apparently. Still, my amaryllis has certainly cheered up the view to the window, if not through it. Thank you for hosting.